(File) Straw-colored fruit bat (Eidolon helvum) at the Zoological Garden Berlin, Germany. 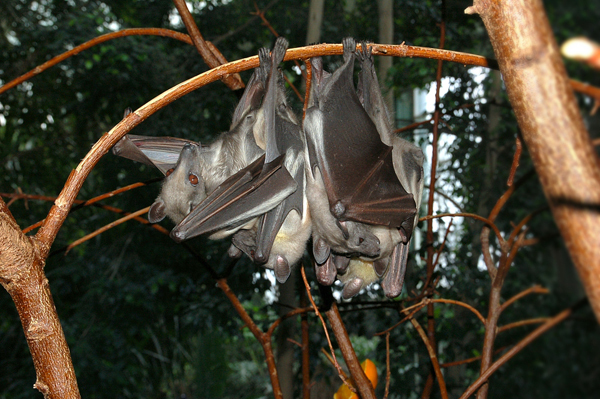 This species, along with other fruit bats, is present in the Ebola impacted area and may have been a carrier. Photo by: Fritz Geller-Grimm/Creative Commons 2.5. Batemans Bay is in a state of emergency after the Australian town was taken over by a massive swarm of 100,000 bats, while the New South Wales government scrambled to allocate $2.5 million to address the issue, local media reported on May 23. The gray-headed flying foxes have been a serious inconvenience to residents of the town with their noise and odor, according to the Australian Broadcasting Corp. (ABC). “We’ve had over 100,000 flying foxes settle in Batemans Bay, we think that represents about a quarter to a fifth of the entire national population, so it has been quite an extraordinary circumstance,” said the NSW Environment Minister Mark Speakman. “We’ve had many residents complain, they feel they’re prisoners in their own homes, they can’t go out, they have to have air conditioning on the whole time, windows closed,’ added Speakman, who said the bats had to be relocated. “[The circumstances] really amount almost to a state of emergency,” he said according to ABC. The Eurobodalla Council proposes to force the bats out of the area by spraying trees with deterrents and using giant inflatable tube men to scare the animals away. Officials have also considered the removal of trees and other vegetation. “The current method that seems to be the one that’s working the most … is extremely loud industrial noise combined with smoke and combined with bright lights in an effort to make the area where the flying foxes roost to be as uncomfortable as possible,” said Eurobodalla Mayor Lindsay Brown. However, the final decision on how the bats will be taken out of the area is yet to be made. The gray-headed flying fox bats are listed as a vulnerable species, meaning they cannot be killed. Animal rights groups say that people must be patient, and that the bats will leave the area when they are ready. The bats are on almost every surface and in every tree, according to Sky News. “I can’t open the windows, I can’t use the clotheslines, it’s just, I can’t study because the noise just goes constantly. I can’t concentrate. It’s not fun.” said Danielle Smith, who lives in Batemans Bay, according to Sky News. “The bats came and they are just out of control. We just can’t do anything because of them,” she said.